The black Elite Wired Cardioid Conference Microphone from Revolabs provides users with a combination of performance features and contemporary design elements to meet the demands of various conference environments. The cardioid polar pattern provides pickup from the front of the mic, and rejects off-axis sound, lending to improved isolation of the main sound source while minimizing background noise. 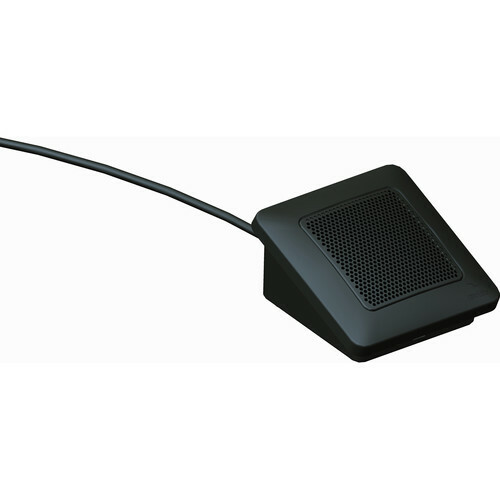 Using the same form factor and user interface as Revolabs Executive Elite Wireless Microphones, the Elite Wired Microphones can be used in environments in which wired and wireless microphones are used in tandem. Part of an installed audio solution, Revolabs' Elite Wired Microphones can be integrated with audio post-processing and mixing appliances in support of any unified communications application as well as other applications requiring audio support. Box Dimensions (LxWxH) 6.0 x 5.8 x 2.4"